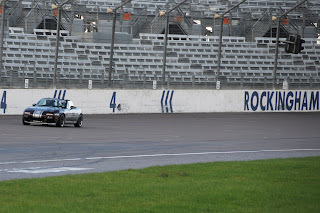 Rockingham Motor Speedway in the wet ! 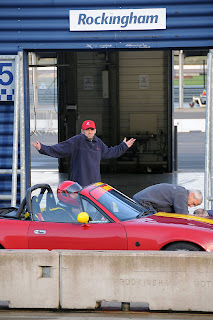 Project Merlot spent Sunday 26 October at Rockingham with a number of other MX-5s on a track day promoted by Mazda on Track. 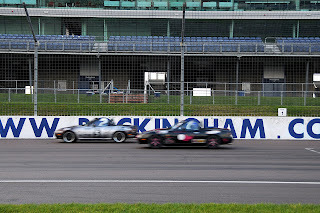 Rockingham Motor Speedway is the UKs only banked oval raceway and our circuit included part of the oval as well as a more traditional twisty infield section. The most challenging part of the day was the weather. Up until minutes before track time began it rained making the track very slippery indeed and causing plenty of spins and pushing the skills of many of the drivers to the limit just keeping on the black stuff! By the time of the afternoon session it had dried considerably and a quick change of tyres for the Merlot saw it go out on its semi slick Toyos. This was like driving a different car as speeds and confidence grew and we managed to get the most out of the faster banked sections of the track. This was a welcome return to a proper circuit for the Merlot and great to be on track with other MX-5s for the first time for some while.